When it comes to wedding favours, boxes of cookies or bags of candied almonds are nice but I like something a bit different. After all, if you're going to spend time and money choosing or making favours, they should be something your guests will enjoy for a long time afterward... Something they'll really remember your wedding by. 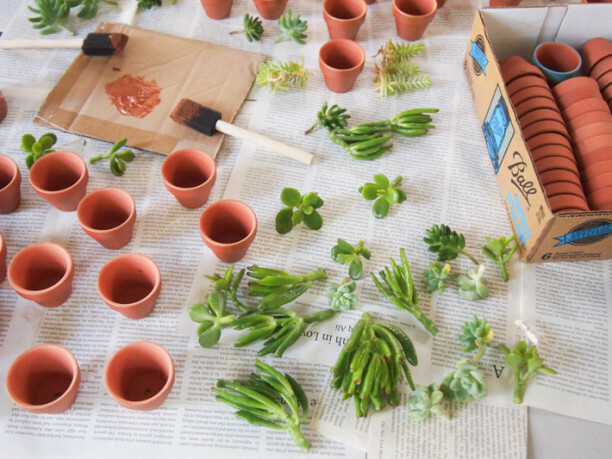 Which is why my pick for the perfect wedding favours are potted succulents. 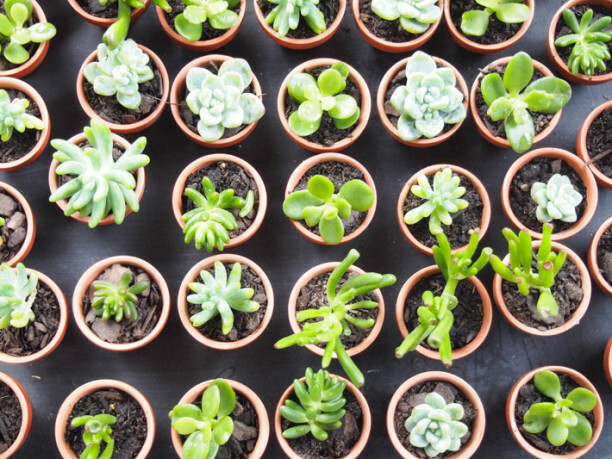 Potted succulents are cool and hard to kill which qualifies them as all round great gifts. They're also small, cheap and fully customisable, which makes them particularly useful as DIY wedding favours. These hardy plants are also super easy to care for, so as long as your guests provide them with a sunny window and some water every two weeks, they'll keep growing and thriving long past the honeymoon. 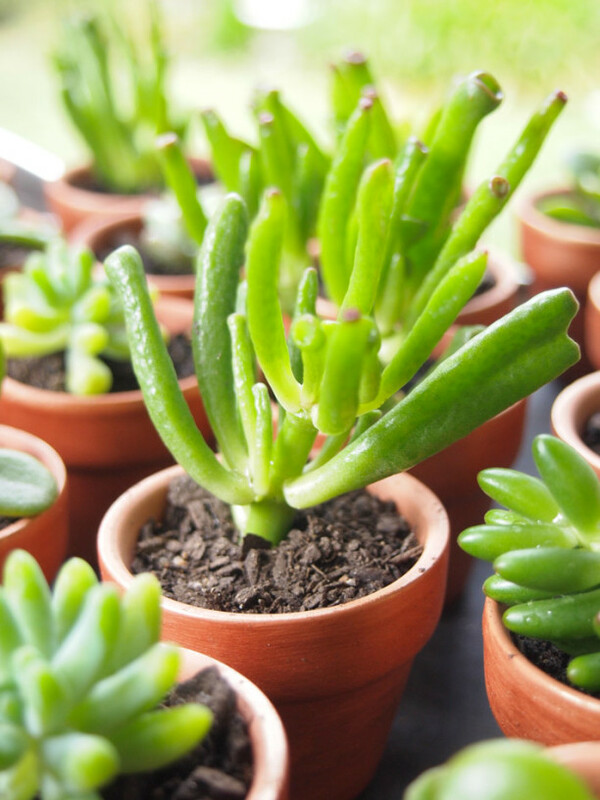 Once you've chosen the succulents, your next consideration is pot type and size. As a traditionalist I like terra cotta, which you can find for between $1 and $2 a pot depending on how big you go. For wedding favours I think somewhere between a 5 and 7cm diameter pot is lovely. 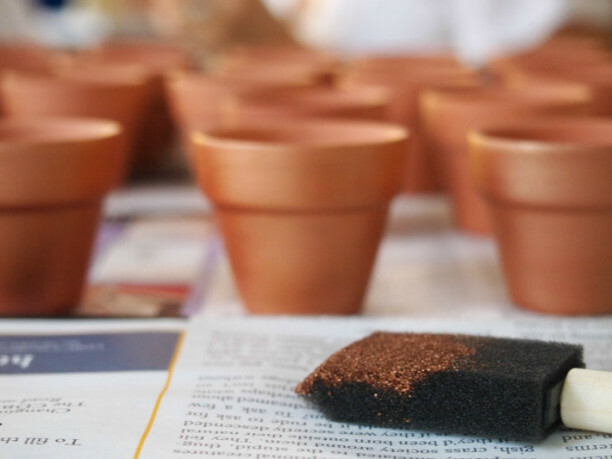 You can leave the pots natural or paint them in your wedding's theme colours to boost their impact. 1. Find a bit of the plant that you think would look good in your pot and snip it off leaving a 5 – 10 cm stem. Using a clean, sharp blade will help prevent bacterial and fungal infection, but if you're desperate and unarmed you can just snap off the bit you want. 2. Dry the cutting in a well-ventilated area our of direct sunlight for a few days to allow the cut to 'scab over'. This prevents fungus getting up into your succulent and killing it. 4. Spoon the potting mix into your containers. 5. Press a finger down into the soil to make a hole big enough for your cutting to fit in. Pull away any leaves that don't stand up to aesthetic considerations of the pot and press the soil in around the stem to hold it firmly in place. 7. If you like, add some decorative pebbles or gravel on top of the soil, and tie a tag with each guest's name written on it to the pot with some twine.